More often than not I read books to be taken on a journey into another experience, often as escapism. Sometimes I read books because they matter – because they have urgent and important things to say. 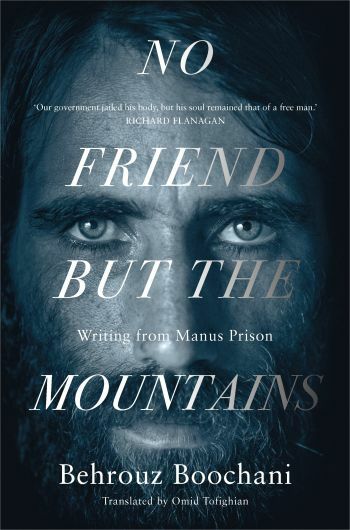 No Friend but the Mountains by Behrouz Boochani is a book that matters. Constructed from text messages painstakingly tapped out on a contraband mobile phone from within Manus Island Prison, the mere existence of this book is an incredible achievement. That it also manages to be a complex and eloquent work of philosophical scholarship is truly remarkable. I’m not sure what I expected from a ‘refugee memoir’, perhaps naïvely I expected more rage, more camaraderie and solidarity, more emotive imploring? Instead I was surprised by how intensely controlled this work is. A scholar of political science made prisoner, Boochani writes with poise and sharp intelligence. Shifting the focus from essentialist performances of refugeehood to the detention/prison systems that incarcerate, he denies our desire for sentimentality and victimhood. ‘A twisted system governs the prison, a deranged logic that confines the mind of the prisoner’. When applied to cigarettes and telephone rights - given as ‘privileges’ to prisoners so they can be taken away without rhyme or reason - this system is at its most perverse. Time is not delineated in No Friend but the Mountains. Days could be months, could be years. Yet the book can be loosely seen in three parts: the boat journey from Indonesia; arrival at Christmas Island and first encounters with the Australian detention system; and Manus Island Prison. Each of these parts builds in tension, as more and more men are broken by the system, and all lead towards the eruption of violence on Manus Island and the murder of Reza Berati. No Friend but the Mountains is an act of witness through five years of incarceration. It is also an act of survival - one mans experience of a system designed to break him. ‘Australia has done everything it can to ensure that we’re…not recognised as professionals, as valuable and insightful contributors to the discourse’ – this book proves otherwise. No Friend but the Mountains provides urgent and necessary insight into the horror that has been perpetrated on Manus Island. Boochani’s No Friend but the Mountains ensures we can never say we did not know. Kate Rendell works as a communications manager in the arts. She is also a freelance writer and researcher. First and foremost though she is a reader.